The United Auto Workers demand a do-over for a vote the union lost—and want critics like me silenced. Picture an election where an entity is given nearly unfettered access to voters for two years and then is allowed to call for a surprise vote with only a few days' notice. Then imagine that the entity loses the vote and complains that "outside forces"—who happen to be community leaders—should not have been allowed to speak or share their point of view. While most Americans can contemplate such a scenario playing out in another country, this is what has been happening in Tennessee. Just over two weeks ago, an election was held at the Volkswagen plant in my hometown of Chattanooga to determine whether the United Auto Workers would represent the workers there. UAW operatives spent two years inside the plant working to organize it. Initially, the UAW tried to take away the workers' right to vote and force its way in through "card check," an attempt to entrench the union without a democratic election. Fortunately, the company insisted on a secret ballot for its employees. 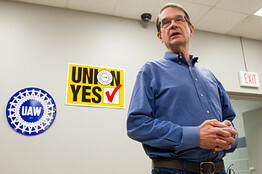 They voted on Feb. 14 not to organize, although in the week leading up to the vote, only the UAW was allowed inside the plant, where the union was given an audience with the workers on company time. The future success of the plant is an issue of great importance to me and our community, and I have been involved with it in various capacities for many years. As mayor of Chattanooga, I worked with others to build the industrial park where Volkswagen now sits. As a U.S. senator, I made the first call to Volkswagen to ask that they consider Tennessee, and key discussions around VW's recruitment took place at my home in Chattanooga.